One of the reasons we love North Idaho is because within a radius of only about 100 miles, Nature shows off in a dazzling array of variety. Cataldo, Idaho is only about 30 miles from Downtown Coeur d’Alene. You’d think that the terrain wouldn’t change much within a 30 mile driving distance. In actuality, the scenery changes quite dramatically. Turning South on Highway 3, we discover a lovely sequence of smaller lakes surrounded by open areas of pasture and wetlands, bounded by pine-crested mountains. These are the “Chain Lakes”. It’s a beloved remote and largely untouched Wilderness. Rose Lake is the first in a series of about a dozen small lakes. The Coeur d’Alene River also wends its way over that same terrain on its journey to Lake Coeur d’Alene. Nature practically SINGS in Rose Lake! This verdant, open area serves as a kind of wildlife sanctuary, home to Canadian Geese, White Swans, Great Blue Herons, Bald Eagles, Moose & other majestic creatures. 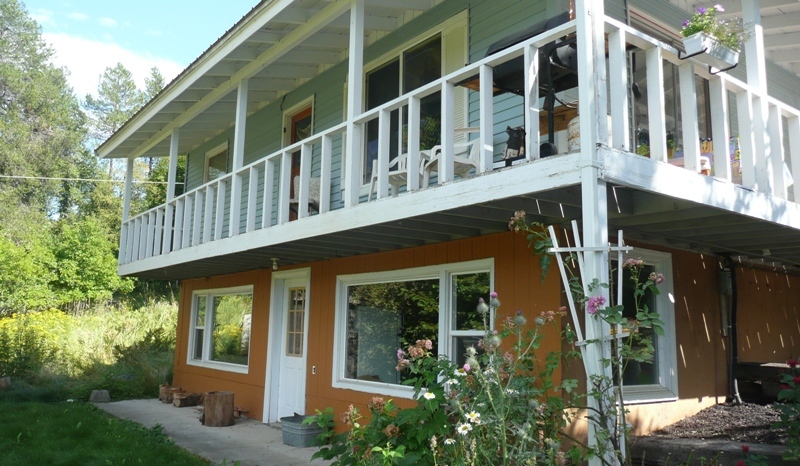 Rose Lake is the idyllic setting for this 3BR respite on scenic .5 Acre with lovely Lake View, Verdant Lawn & Pasture, & Fruit Trees. Inhabit Nature’s harmonies from the wrap-around deck or from the sunlit living room with large picture windows. “Antique” Lighting & Fixtures add a charming element of nostalgia to the New Cabinetry, Flooring & Windows & Daylight Lower Level & RV Parking. The Rose Lake Sportsman’s Access & public dock is nearby. Write “Subscribe Me” in the subject line. This entry was posted in .5 - 1 Acre, $100K - $200K, Cataldo, Lake View, Mountain View, Our Listings, Rose Lake, Silver Valley, Under $150 K, Under $150,000, Vacation or Second Homes, Video, View Property, Virtual Tour, Water View, YouTube and tagged .5 - 1 Acre, $100K - $200K, 1.5BA, 1500 sq ft, 3BR, 83810, Bald Eagles, Breakfast Bar, Canadian Geese, Cataldo, Chain Lakes, Coeur d'Alene River, daylight basement, Family Room, Furnace, Great Blue Herons, Highway 3, Lake view, Living Room, moose, Mountain View, new cabinetry, new flooring, new windows, Our Listings, pasture, Photographs, Pricing, Public Dock, Rose Lake, RV Parking, Sportsmans Access, Under $150 K, updated, Vacation or Second Homes, Video, View Property, Virtual Tour, Water View, White Swans, wildlife, wrap around deck, YouTube. Bookmark the permalink.